Responding to a movie, sometimes, is like tuning a transistor on a stormy night. It takes a while to catch the exact frequency – and when I found myself shifting in my seat during Ghanchakkar, I thought, at first, that this was the reason. I thought that my antenna hadn’t yet fully tuned into this not-easily-classifiable film. At times, this is a farce, with horny villains stripped down to their underwear. 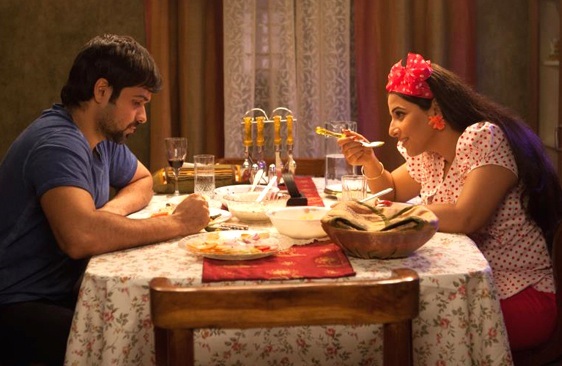 At times, this is a rambunctious comedy with a set of running gags – about the culinary skills of the heroine, about her loud dress sense, about an oddball who prefers to purchase groceries late at night, about a clingy mother. At times, this is a heist-gone-wrong thriller, infused with the mechanics of a detective story, including a mystery caller. At times, this is a black comedy, where a man can meet his end by means of a fork and a banana peel. And at times, this is a quasi-existential drama about someone who’s slowly losing his mind, beginning to suspect his friends, his wife, even himself. But at some point, I just threw up my hands and tuned out. Raj Kumar Gupta is a tasteful filmmaker with an eye for colourful detail (a security guard at an ATM licking clean a matka kulfi) and the archly droll moment. (My favourite was the one with a housekeeper named Ramesh.) But he cannot rein in the various dimensions of the story, and the film feels like it’s stuck in a loop. Like the director’s Aamir, Ghanchakkar is about a man (Sanju, played by Emraan Hashmi) who’s yanked around endlessly. Vidya Balan, as Sanju’s wife Neetu, has very little to work off, so she lets her clothes do all the acting. Rajesh Sharma and Namit Das do their best to liven the proceedings, which, given this loony material, should have been a lot more fun. By the fifth reference to Neetu’s unfamiliarity with a salt shaker, we’ve had enough. And the film keeps changing its tone till the very end, which is shockingly gruesome given how it all began. I felt cheated – not because I dislike twists, but because rug-pulling is an art, and here it felt like a stunt. Perfectly put!! exactly felt the same about the movie.My fav scene is the bank robbery.Brilliant! Hi can you suggest a blog on Indian movie music review. And English movie review. @Chandrika, I like MusicAloud for detailed reviews. Milliblog is OK too. As for Ghanchakkar, well and truly agree entirely. I liked the movie-lots of small moments with great detail, and competent performances. I’ve reached a point in my appreciation of Emran and Vidya that I might just watch anything that features them regardless of the content. I think the film had its flaws but I never felt unengaged by the proceedings. dk: I guess it was fun, but for me it was a case of too little, too late.